May | 2012 | Go Chapel Hill! Research Triangle Park, NC (May 30, 2012) – Triangle residents have a few more weeks to share feedback on environmental issues on the Durham-Orange Light Rail Transit Project. The 45-day comment period ends on June 18, 2012 and follows the publication of a Federal Register Notice of Intent in early April. The Federal Transit Administration (FTA) and Triangle Transit intend to prepare an Environmental Impact Statement (EIS) to study the proposed Project. The comment period allows public, Federal, State and local agencies, citizens, elected officials, and Project partners to identify and define the issues to be studied in detail in the Federally-required environmental process in accordance with the National Environmental Policy Act of 1969 (NEPA), as amended. Environmental work follows the selection of light rail transit as the preferred technology in the proposed 17-mile corridor by the Durham-Chapel Hill-Carrboro Metropolitan Planning Organization in February 2012. To date, more than 100-comments have been received from two workshops in May in Chapel Hill and Durham and online at the Project Web site at http://www.ourtransitfuture.com. All comments received will be incorporated into the final published Scoping Report. The Federal Register Notice, which includes the Project’s Purpose and Need, Study Area, and EIS Alternatives, is at: http://www.ourtransitfuture.com and http://www.gpo.gov/fdsys/pkg/FR-2012-04-03/pdf/2012-7897.pdf. The Triangle Regional Transit Program is a comprehensive study of fixed guideway transit opportunities to complement new and expanded bus service. The Triangle Regional Transit Program is managed by Triangle Transit. Hurry up and put together a great video and send it in… click for contest details! Driving Less, Feeling Great!!! Go Chapel Hill! Go Chapel Hill – Carrboro presents the Annual Spring Roll Cruiser Ride. Cyclists are invited to meet at the Wallace Deck, 150 E. Rosemary St., at 5:30 p.m. Friday, May 18, for the annual cruiser ride. This no cost event is open to families (2 miles) as well as cruisers (8 miles) to enjoy the spring weather and help promote riding a bike for work, errands and play. There is no registration fee. William Dawson’s Band will kick off the evening along with contests, fun and food! Bring your bike, dress it up for the Most Outrageous Bike Contest and wear your most fun cycling clothes!!! Come and learn how to load your bike onto transit buses from 8:30 a.m. to noon Saturday, May 19, at the Farmer’s Market at University Mall, 120 S. Estes Drive. Enjoy this no cost workshop, get your name in the hat for a drawing and enjoy a quick tour of a Chapel Hill Transit Bus! If you can’t bring a bike, come by anyway. a bike will be provided to show you the technique. For more information on these events call 919-969-5065. Go Chapel Hill – Carrboro Bike Breakfast Workshop! THIS TUESDAY, May15, 7am to 10am: Next to Armadillo Grill! 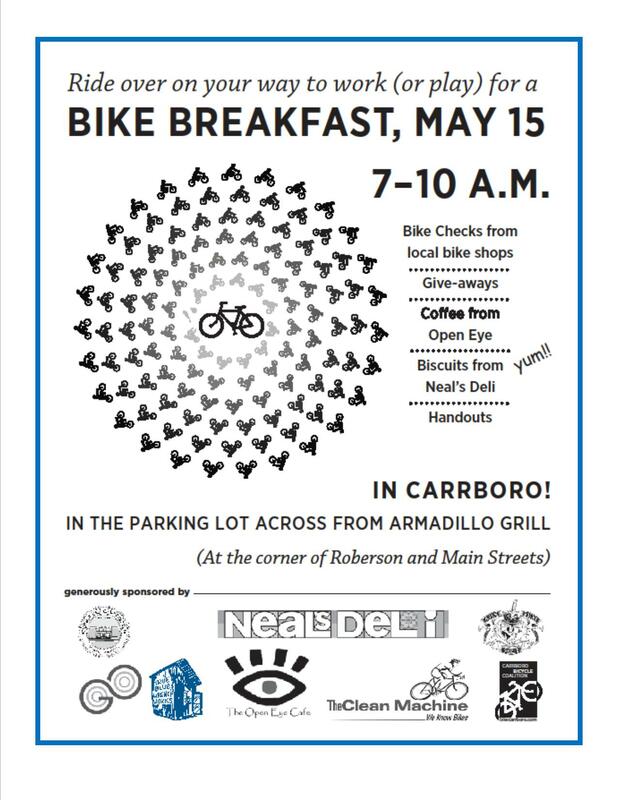 Join us Tuesday morning in the parking lot next to Armadillo Grill for Neil’s Deli Biscuits and Open Eye Cafe Coffee, free give aways, bike inspections, wrenching and information on alternative transportation use. Cycling More, Feeling Great!!! Go Chapel Hill – Carrboro!